I will examine several energy budgets for the Earth of recent years and address the issue of the extent of radiation absorbed by the atmosphere being re-radiated as long-wave infra-red radiation to the Earth's surface and absorbed there. This is a very important issue in understanding the role of energy transfer in the lower atmosphere, the troposphere. This role bears greatly on our understanding of how infra-red absorbing and emitting gases affect the equilibrium climate. The extent to which increasing concentrations of carbon dioxide in the atmosphere might cause global warming can be estimated with this understanding. The warming of the surface due to increased carbon dioxide concentrations in the atmosphere is extremely dependent upon the extent of the so-called back-radiation. If there is little back-radiation compared to the very large back-radiation claimed in the standard model for measuring the surface warming produced by increased carbon dioxide, then there will be much less warming than the minor warming predicted with the standard model. I will demonstrate reasons to be unsettled about the settled science claimed for the catastrophic man-made global warming hypothesis. I will explain why these Energy Budgets are not really energy budgets at all. That is, they do not conserve energy because they do not follow a particular packet of solar insolation absorbed by either the atmosphere or the surface in time and location. They do not show where that energy is deposited at a particular instant of time along a timeline. Neither do they follow the flow of that particular packet of energy through the Earth system. They in fact mix in various energy packets arriving at other times in unquantified ways. Absorbed back-radiation in the large amounts often claimed in Greenhouse Gas Theory is one clear violator of the need to observe one particular packet of energy at one instant of time or to follow it through the Earth system. One can use the standard power density approach only if one knows how much infra-red radiation is absorbed by the surface and atmosphere and how much is reflected from each. Power density is a flow of energy per unit time per unit area, so it is still critical that energy be conserved in the Earth system in addition to maintaining a balance of power fluxes across boundaries. Still another problem is that the power densities in various forms of energy vary greatly by altitude in the troposphere. Infra-red absorbing gases may change the distribution of energy in the Earth system, but they cannot change the amount of energy absorbed in the Earth system unless they change the reflectivity of the atmosphere or the surface. The condensation of water vapor is an obvious means of changing the reflectivity of the atmosphere, though it is hard to quantify the resultant effects. A less obvious change of reflectivity might be due to increased carbon dioxide encouraging so much more plant growth that land mass reflectivity changes. If we focus on the surface temperature as particularly important to mankind and our quality of life, we should be very interested in the manner in which energy is transported away from the surface by the atmosphere. We have to note that the lower troposphere plays the most direct role in our weather. The surface is heated by solar insolation transmitted by the atmosphere and absorbed by the surface. The cooling effects on the surface are dependent on the emissivity of the surface, the loss of energy due to water evaporation, and direct conduction due to air molecules colliding with the surface. Water evaporation soaks up large amounts of heat and as water vapor is carried aloft, it condenses into liquid or ice commonly at altitudes of about 2 to 4 km, at which point a great deal of energy is released to heat the atmosphere. Some of the heat energy that is radiated as long-wave infra-red radiation from the surface is transmitted through the atmospheric window directly into space. Some is absorbed by water vapor or by carbon dioxide in the atmosphere. Because of the high collision rates of molecules in the lower atmosphere, the absorbing water vapor or carbon dioxide molecules will most often lose the absorbed energy to surrounding nitrogen and oxygen molecules or to argon, before they can re-radiate the absorbed infra-red radiation that originated from the surface. This is one way in which the rate of loss of heat energy decreases in the lowest part of the troposphere with increasing altitude very close to the surface. The amount of radiant energy transfer then stabilizes in the first few hundred meters altitude at a level dependent upon the density of water vapor and other infra-red absorbing and emitting gases such as carbon dioxide. The long-wave infra-red emitted from these infra-red active gases is radiated at the speed of light until it is absorbed again. That energy transport is faster than the convection or the evaporation/condensation mechanisms of water. This faster radiation transport of energy to higher altitudes is a cooling effect, so higher concentrations of infra-red absorbing gases have a cooling effect in a negative feedback or a counteracting relationship with any warming caused by back-radiation. Greenhouse Gas Theory says that the long-wave radiation from each molecule is emitted isotropically in all directions. All of the downward radiated long-wave infra-red is absorbed by the surface, which is said to be a black body absorber for such long-wave radiation. I will show that Energy Conservation assures us that the surface does not absorb down-welling atmospheric radiation, but either reflects it in its entirety or that more likely the supposition of isotropic molecular emission is actually incorrect because infra-red photons are created by a directional field dependent upon the temperature gradient. The upwelling radiation has a magnitude determined by the temperature gradient over the mean free path length of the radiation at a given wavelength. Both the upwelling and the down-welling infra-red radiation are less than is normally depicted in the standard model of catastrophic man-made global warming. Because no down-welling long-wave infra-red radiation is absorbed by the surface in the usual equilibrium condition of a cooler atmosphere over a warmer surface, the upwelling long-wave radiation is the only radiant energy transport mechanism. Thus the emission of infra-red radiation by water vapor or carbon dioxide is a very rapid mechanism for the cooling of the lower troposphere. That mechanism becomes less important as the concentration of the absorbing/emitting molecules decreases with altitude relative to nitrogen and oxygen, which causes the emissivity of the atmosphere to decrease with altitude. Convection then again becomes a more important mechanism for energy transport to higher altitudes, but this is a slow energy transport mechanism. Water vapor density decreases more rapidly than does the overall atmospheric density. Since water vapor is much the dominant infra-red active gas, its role in rapid energy transport rarely extends to altitudes greater than 4 km. The more infra-red radiating molecules in the atmosphere, the more energy is rapidly transported upward through the atmosphere. Air humidity can vary greatly and it has a major impact on the rate of temperature change with altitude. The more water vapor in the air, the smaller the temperature gradient with increasing altitude. This is due to the increase in rapid transport of energy upward due to the increased emissivity of the air when it is humid. Higher humidity causes a powerful cooling effect because it is maintained by increased surface evaporation and causes increased radiative losses as the air infra-red emissivity increases with added water vapor. If there were increased down-welling radiation in accordance with Greenhouse Gas Theory and it were absorbed by the surface when the humidity was high, then the surface temperature would be greater when the humidity was high. The data clearly shows that the surface is cooler when the humidity is high, which clearly shows that the surface is not absorbing added down-welling long-wave infra-red radiation. Consequently, the increased emissivity of air due to high humidity causes a decrease in surface temperature because the direction of the emitted long-wave infra-red energy is in the upward direction. Increased carbon dioxide will also cool the lower troposphere, though it increases air emissivity about 2.5 times less than does water vapor for a given partial pressure and its concentrations are much lower. Both water vapor and carbon dioxide also absorb some of the incoming solar insolation and so have a surface cooling effect by decreasing the atmospheric transmission of solar energy. The evidence is mounting that these infra-red absorbing gases do more to cool the lower troposphere than they do to warm it. The warming effects are due to the rarer condition when the lower troposphere temperature is greater than the surface temperature and due to the narrowing of the atmospheric window through which radiation from the surface is not absorbed anywhere in the atmosphere. These warming effects prove to be smaller than the cooling effects are, contrary to the Greenhouse Gas Theory which wrongly proclaims the narrowing of the atmospheric window by infra-red active gases to be the only important effect on surface temperatures. Let us discuss the amount of power density in the atmosphere which is absorbed by the surface due to surface-incident infra-red radiation from the atmosphere since we see from the above introduction that this is a critical issue for surface temperatures. This paper will calculate the equilibrium contribution for such absorbed power from the atmosphere and therefore of energy which can become added heat in the surface. Some comments on limits for non-equilibrium absorption of radiated energy from the atmosphere will also be made. Let us consider a few versions of the Earth's energy budget first and then I will discuss the implications for the adsorption of energy at the Earth's surface due to down-welling atmospheric infra-red radiation. An energy budget currently posted by NASA is shown in Figure 1 below. Figure 1. The principal NASA energy budget for the Earth as of February 2013. Note the huge surface radiation and the huge radiation from the atmosphere all of which is absorbed by the surface. 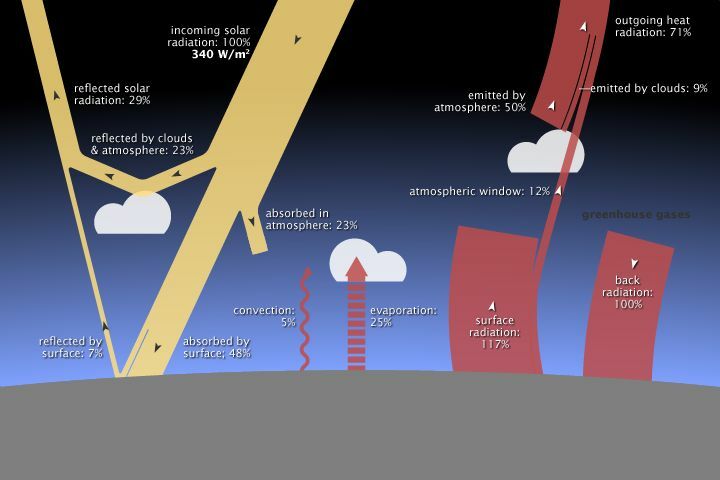 The surface-absorbed atmospheric down radiation is 100% of the solar insolation at the top of the atmosphere and it is all claimed to be absorbed by the surface. The greenhouse gases absorb the radiation emitted from the surface at a 105% level and they also absorb 23% of solar insolation for a total of 128%. They emit radiation at a power density of 159%. But only 71% of solar insolation in total was absorbed by the entire Earth system! Fig. 2. This ephemeral NASA energy budget showed a much reduced radiation emission from the surface of only 21% and no radiation from the atmosphere to the surface. The IR-active gases radiate a power density of 64%, compared to the 159% radiated in Fig. 1. The entire Earth system absorbed 70% of solar insolation and no energy transport mechanism claims to use more than 70% of the power. We will compare these more recent energy budgets from NASA with the Kiehl-Trenberth energy budget of 1997 which was featured in the UN IPCC 4th assessment report of 2007. That budget is shown below with my conversions to percentage of the solar insolation power density at the top of the atmosphere. Figure 3. The Kiehl-Trenberth energy budget for the Earth of 1997, which was featured in the UN IPCC report of 2007. This energy budget claims a 114.0% emission of radiation from the surface with a power density of 89.7% absorbed by IR-active gases in the atmosphere. Radiation from the atmosphere to the surface is 94.7% and it is claimed to be entirely absorbed by the surface. The infra-red active gases emit a total infra-red radiation of 151.7% when only 68.7% of energy was absorbed from solar insolation by the entire Earth system. The items in the several energy budgets can now be compared. I will try to determine the best likely values for the various energy items while treating any down radiation from the atmosphere which is absorbed by the Earth's surface as a variable. The percentages are referenced as they are in the energy budgets of Figs. 1 - 3 to the average solar insolation at the top of the atmosphere. In the apparent manner of the Energy Budgets shown above, I will partition the energy absorbed by the surface from solar insolation among Conduction/Convection, Evaporation of Water, and Infra-red Radiation as the energy outflow mechanisms of the surface. But, it should be remembered that even a few hundred meters above the surface, much of the surface infra-red radiation has been absorbed by water vapor and carbon dioxide or other infra-red active gases. Those IR-active gases transfer much of the energy they have gained by absorbing energy radiated from the surface through many collisions to the far more numerous non-absorbing air molecules. This is a conversion of infra-red radiation energy transport into conduction/convection energy transport. So, the radiant power and the air conduction/convection energies are not constants in the lowest part of the troposphere for this reason. Then the density of infra-red absorbing and emitting molecules continue to decrease and the radiant energy component falls off further. I will discuss these energy item by energy item. After discussing the energy items, I will present a number of mathematical relationships they must maintain for energy conservation purposes. The abbreviations for each will then be used in the expressions of these relationships. Atmospheric Reflection (ARfl): This is reflection from the boundary layers of the atmosphere, from aerosols, and from clouds. The energy budgets vary from 22.5% to 26%. But what is more nearly constant is the sum of the atomspheric and the surface reflectivities at 30%, 30%, and 31.3%. The greater problem is in how the reflectivity is divided by type. The most recent NASA values ought to be the best, especially given that there is no real advantage to the global warming alarmists as long as the sum of the surface reflection and the atmospheric reflection is 30%. The newest values also lie between the older values. Surface Reflection (SRfl): See the discussion under Atmospheric Reflection. In addition, a 4% reflection as stated in the NASA 2011 budget is clearly too low a reflection value in my experience with UV, visible, and shortwave IR on surfaces. Atmospheric Absorption (AA): This is a hard value to measure by itself directly, but it is the difference between 100% and the sum of the Atmospheric and Surface Reflections (30%) and the Solar Surface Absorption. Solar Surface Absorption (SSA): I am weighing the NASA 2011 energy budget more heavily on this one since that actually opens the door more widely for some downward radiation absorption from the atmosphere by the surface. This will be more apparent later in the discussion. Conduction, Convection from Surface at the Surface (CCS): I simply averaged the three Energy Budget values. Evaporation (E): I just averaged the three energy budget values. Surface Radiation at the Surface (SR):This has two components, namely that fraction of the solar insolation absorbed by the surface which is re-emitted as infra-red radiation and any energy re-emitted as infra-red which was absorbed from down-welling radiation from the atmosphere. 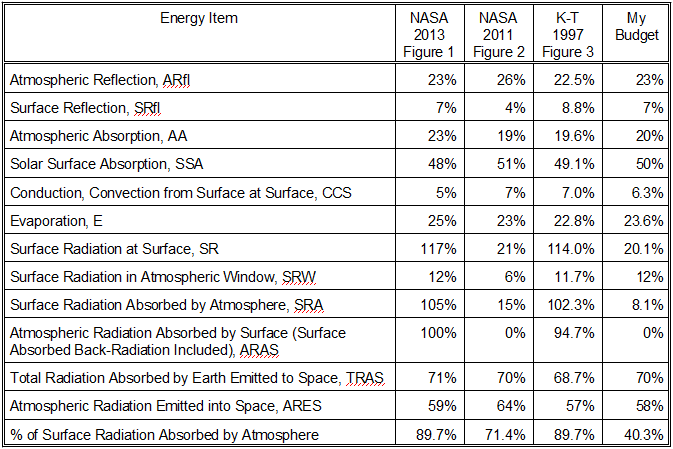 Surface Radiation Emitted to Space without absorption by the atmosphere since the radiation is in the atmospheric window (SRW): I set this in accordance with the most recent NASA data since this should be a very measurable quantity. The atmospheric window has surely been well-understood due to its many military applications in sensor technology. Setting this value higher actually makes the Surface Radiation at the Surface (SR) higher, which might allow the absorbed down-welling radiation value to be greater. 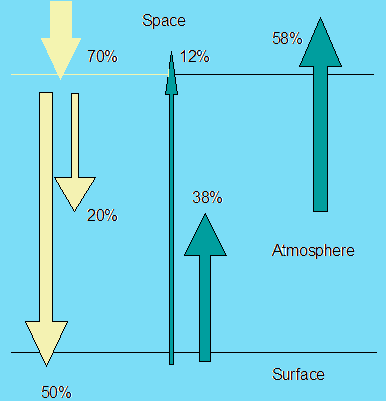 Surface Radiation Absorbed by Atmosphere (SRA): The sum of this and the Surface Radiation Emitted to Space in the Atmospheric Window (SRW) must equal the Surface Radiation immediately at the surface. This value was fixed at the largest value it can have. The basis for that will be explained later. This is an important issue. 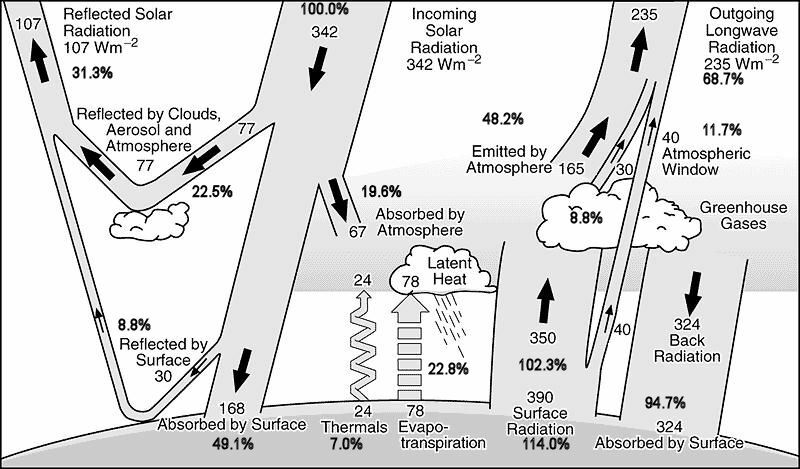 Atmospheric Radiation Absorbed by the Surface (ARAS): This is any down-welling radiation from the atmosphere, including back-radiation, which is actually absorbed by the surface. It is assumed here that it is possible for some of this radiation to be reflected from the surface without absorption. That reflected energy may appear to have been emitted from the surface. Total Radiation Absorbed by Earth and Emitted to Space (TRAS): This value clearly should be 100% minus the reflected sum, which all accounts set at or near 30%. Atmospheric Radiation Emitted into Space (ARES): This plus the Surface Radiation Emitted to Space through the Atmospheric Window (SRW) must equal 100% minus the solar insolation reflected back to space, which is about 30%. % of Surface Radiation Absorbed by Atmosphere: This is just the (Surface Radiation - Surface Radiation Emitted to Space in Window)/ (Surface Radiation). These conditions are satisfied by my Earth Energy Budget. How Much Down-Welling Radiation is Absorbed by the Surface? Fig. 4. The temperature and density profiles of the Earth's atmosphere are shown as a function of altitude in this plot. Initially as the altitude is increased, the temperature falls in a linear fashion and then becomes constant for a distance. The linear decrease is in the troposphere and the constant value is in the tropopause. The constant value is about 216.65 K. The temperature never becomes as cold again until above 70 Km altitude, where the atmospheric density is virtually zero. There are no significant numbers of greenhouse gas molecules at this altitude. 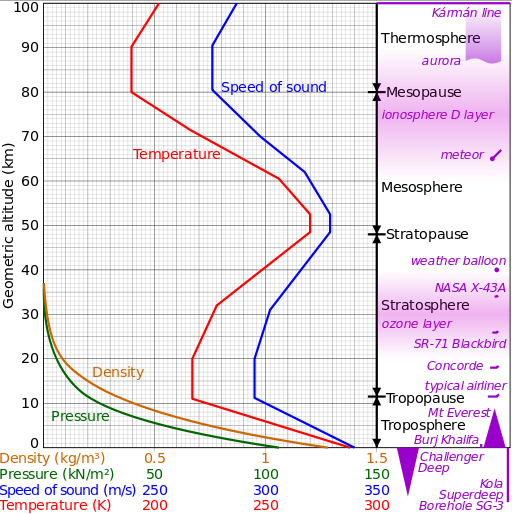 where Ts is the surface temperature and Tt is the temperature at the top of the troposphere and in the tropopause. For now, I will assume an emissivity of one here. In reality, the emissivities are not well-known, but are less than one. The first term is the larger term, so reducing the emissivity of that term does the most to decrease the maximum power generated by the surface due to its temperature. One can make P larger by making the top of the troposphere emissivity smaller also, but that comes at a big cost in that it means opening up the atmospheric window and losing the possibility of the atmosphere absorbing much of this power density. 100 (263.26 W/m2 / 341 W/m2) = 77.2%. Now we have the maximum radiation the atmosphere can absorb from the surface due to its temperature being 287.65K and if we add the 23% of the solar insolation absorbed by the atmosphere according to the February 2013 NASA Energy Budget of Fig. 1., we find that the atmosphere cannot have more than 100.2% of the energy absorbed even under the unphysical assumptions of this Energy Budget. Yet that 2013 NASA Energy Budget claims the atmosphere radiates 100% power density to the surface at the same instant it is radiating 59% to space, for a total of 159% radiated power density from the atmosphere. Not only does this so-called Energy Budget fail to conserve energy in reality, but it also fails to conserve the energy sums in the fantasy world it has created. Energy Conservation immediately tells us that the maximal absorbed power by the atmosphere from the surface radiation value calculated above is too high, however. Recall that 30% of solar insolation power was lost due to reflection, so this power was never absorbed by the Earth system. The equilibrium earth is losing power into space carried by infra-red radiation to the tune of 70% of the incoming solar insolation. The total amount of power density in the Earth system of atmosphere and surface is 70%. The black body calculation of the power absorbing capacity of the atmosphere might have proved to be lower than 70%, but it is higher, so it does not provide the upper limit. What is the maximum power that the atmosphere can radiate anywhere? In my budget, it absorbs a power density of 20% of solar insolation from the incoming solar radiation, AA. 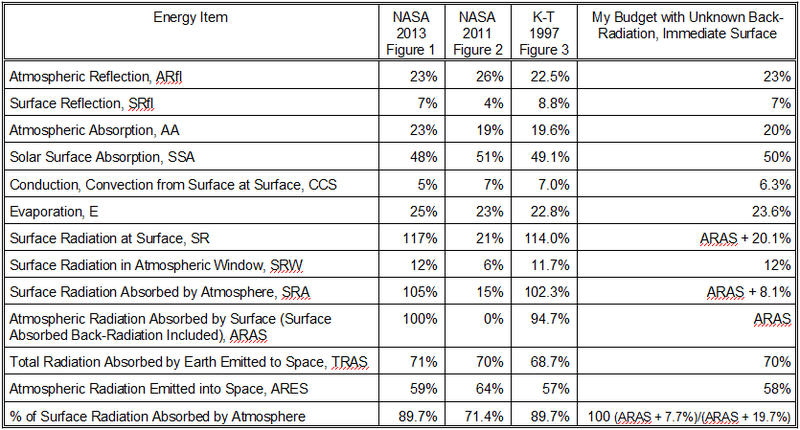 Of the 50% of solar insolation absorbed by the surface, 12% = SRW was sent through the atmospheric window into space. The other 38% that enters the surface is transferred to the atmosphere. The atmosphere had absorbed 20% of its energy directly from incoming solar insolation, AA. Thus, the most power density in the atmosphere, ARES, is AA + SSA - SRW = 20% + 50% - 12% = 58%. In the equilibrium condition, energy flows into the atmosphere at a rate of 58%. Now the entire Earth system absorbed energy at a rate of 70% (TRAS). Of that, the surface emitted 12% directly into space without absorption by the atmosphere. Subtracting 12% from the total Earth system power density outflow of 70% at equilibrium, we find that the atmosphere has to supply an outflow of radiation into space, ARES, at a rate of 58%. But, 58% power density or energy flow rate density is all the atmosphere has to supply, because that is the power inflow rate. Therefore, the atmosphere is not supplying the surface with any power density in this equilibrium condition. The most it can supply any power sink is 58% and that is going into space, not the Earth's surface. Fig. 5. The absorbed energy from the solar insolation is 70%, becoming 20% absorbed by the atmosphere and 50% absorbed by the Earth's surface as shown on the left. The 30% of the solar insolation reflected does not affect temperatures in the Earth system as long as the absorbed energy remains constant. The surface gives up a power density of 12% straight to space and 38% is absorbed by the atmosphere. The atmosphere now has 58% of energy, which it is radiating off into space. The surface never sees more than half of the photon energy entering the Earth system, while the atmosphere never sees more than 58% of the incident solar insolation energy at the top of the atmosphere. This approach to the energy flow is actually following the path taken by portions of the energy of a particular packet of solar insolation energy that enters and leaves this equilibrium Earth system. What we find is that ARAS must equal zero in equilibrium because the atmosphere does not have the energy flow both to supply ARAS to the surface and to supply what it must to the space power sink. Since ARES is the entire supply of energy flow in the atmosphere and 58% is emitted as infra-red radiation to space, there is no additional energy flow to provide a flow of energy to the surface and to be absorbed by it. Thus, energy conservation tells us that ARAS = 0%. There are many additional ways using energy conservation that can easily show that the upper bound on ARAS is many times less than those of the Energy Budgets of Fig. 1 and Fig. 2. Even in non-equilibrium, but still annual period conditions there are obvious limits on the amount of power density that the atmosphere can send as down-welling radiation which is absorbed by the surface. Given that the atmosphere has at most 58% of solar insolation at the top of the atmosphere, it cannot possibly radiate more than 58% power density toward the surface. Indeed, if it did that, the temperature of the atmosphere would be 0 K and it would be absurd to believe that emitters approaching 0 K could emit any but negligible power density. If the Greenhouse Gas Theory assumption that the atmosphere radiates energy both up and down is made, it would be impossible that it could radiate down even half of this power density, that is 29%. Since Earth-wide the transport of energy upward in the lower troposphere will never cease due to a total loss of convection and water evaporation, the transient annual limit on down-welling radiation absorbed by the surface must be much lower than 29%, indeed lower than 14.5%. These are just some of the obvious inconsistencies of the NASA and UN IPCC energy budgets with the Law of Conservation of Energy. Let me note that ARAS, the power density of long-wave radiation from the atmosphere absorbed by the surface is not always zero in transient periods. Of course there are cases when the air moving over a surface is warmer than the surface is. These transient cases are not the equilibrium case and the values for SR, SRA, and SRW should all have been averaged over transient effects such that their values are those of the equilibrium condition. P = σ T4, where P is the total solar power absorbed by the Earth and T is the single infra-red emission temperature of the effective emitter, which is somehow broadly the Earth. The Earth system is assumed to be a black body emitter. Using the fact that about 70% of the solar insolation at the top of the atmosphere is absorbed in the Earth system, while 30% is reflected, we get P = 0.7 (341 W/m2), T = 254.73 K. This is a temperature 33K below the Earth's surface temperature, so many assumed some radiative mechanism had to be found to explain this and their hypothesis was that it was due to greenhouse gases. I will show a simple calculation below that suggests that the explanation is actually in large part a non-radiative one. which is much lower than the surface emissivity which would be measured immediately above the surface when infra-red radiation is the only energy transport mechanism. This low effective emissivity is not only low due to energy going into evaporation and conduction transport of energy at the surface-atmosphere boundary, but it is also reduced by the effect of the entire troposphere above the surface. Among those effects are the short mean free path of radiation which can be absorbed and emitted by water vapor and carbon dioxide. The very low effective emissivity of the surface is that as seen through the filter of the atmosphere from space. It is a measure of how poor the radiative equilibrium of the surface is with space. This implies the dominance of other energy transport mechanisms in the lower troposphere than radiation. which is somewhat lower than the often mentioned 255 K due to making no distinction between the surface and the atmospheric long-wave infra-red emissions and treating the Earth as a black body as was done in the opening paragraph of this section. It is interesting that the Earth surface temperature can be maintained at 287.65 K and the weighted average source emission temperature of the atmospheric emission is so little changed relative to the simple-minded, but claimed to be critical, single temperature emission source model. which agrees pretty well with the brightness temperature of the Earth emission spectrum seen from space at those frequencies for which extensive water vapor absorption of infra-red radiation occurs. (0.12 Ts+ 0.58 Ta) / 0.70 = 253.27 K.
This is very close to the single emission temperature black body model result we calculated in the first paragraph of this section. This effective total atmospheric emission temperature in the U. S. Standard Atmosphere is at an altitude of about 6200 meters and well below the top of the troposphere, but also about 2 Km higher altitude than is affected by the major variations in near surface humidity. The number of molecules per cubic meter at 6000 meters is 1.298 x 1025. It is interesting to note that the Earth emission spectrum where CO2 absorption occurs has a characteristic temperature in the 200 to 210 K range, which is in the upper mesosphere or above 75 Km in altitude in the U. S. Standard Atmosphere. Its density there is extremely low. The number of molecules per cubic meter is only 8.300 x 1020, which is only 6.4 x 10-5 times the molecular number density of the atmosphere at 6 Km near the effective atmospheric emission temperature. In addition, the emissivity of carbon dioxide is probably less than 0.4 that of water per molecule, so the power density emission of CO2 into space is extraordinarily lower than that of water. Does Down-Welling Infra-Red Radiation Reach the Surface in the Equilibrium Condition? We now know that long-wave down-welling infra-red radiation from the atmosphere is not absorbed by the surface under equilibrium conditions due to our application of the Law of Conservation of Energy. This could mean that it is simply reflected from the surface. But, let us now examine whether it can be expected to even reach the surface in the equilibrium condition when the atmosphere has a slowly decreasing temperature gradient with altitude. One can look up from the surface and detect radiation from infra-red emitting molecules when using an infra-red thermometer or pyrometer. These instruments always measure the effective temperature of those emitting molecules, so everyone concludes that the pyrometer is measuring the radiation that every emitting molecule emits in all directions as it would if it were the only emitter surrounded by vast domains of space at a 0 K. But this picture is not the case when examining the surface of the Earth with an envelope of atmosphere with low concentrations of infra-red active molecules for a short distance and then the vast reaches of space at near zero temperature. In the Earth system, the distributed infra-red molecules have a range of temperatures from very near the surface temperature to temperatures of about 216 K at the top of the troposphere. Instrument measured down-welling long-wave radiation spectra are complex with various frequencies represented in distributions not characteristic of the complete broadband Stefan-Boltzmann black body radiator distribution. In addition, there are uncertainties about which frequencies will be absorbed in the various materials and in the complex surface of the Earth. Bear in mind that ARAS, which is zero when the Earth system is in equilibrium, is the Atmospheric Radiation Absorbed by the Surface. That it is zero says nothing about the flux of radiation coming from the atmosphere and measured by a device looking up from the surface. It only says that it is not absorbed by the surface. If there is any such down flux of long-wave power, it is entirely reflected from the surface or it does not actually reach the surface, when the atmosphere is cooler than the surface, which in equilibrium conditions it is. Any such reflected power flux in the atmosphere would be difficult to distinguish from radiation actually emitted from the surface, given that the mean free path for infra-red radiation from water vapor or carbon dioxide in the atmosphere is very short near the surface. Therefore, that radiation comes from molecules only very slightly cooler than the surface. But that reflected energy is also going to be re-absorbed by water vapor or carbon dioxide only a short distance above the surface. This means that the entire process of infra-red emission from one molecule a short distance above the surface, surface reflection, and re-absorption by another molecule a short distance above the surface is a non-event as far as energy transfer is concerned. This is not true for up-welling long-wave infra-red emissions. When that infra-red energy is absorbed, half is emitted upward to lower density atmosphere and travels a longer distance before absorption than is the radiation emitted downward. The density gradient and the reflection of cooler infra-red radiation from the warmer surface results in a net up-welling of radiant energy. This is the opposite of what Greenhouse Gas Theory maintains, but it is consistent with observational measurements of temperatures. Fig. 6. Infra-red thermometers or pyrometers measure both the infra-red radiation emitted from an object and the infra-red radiation it reflects. The reflected infra-red from shiny objects and from objects at temperatures not much different than their surroundings are especially problematic. One is often advised to apply a matte black tape to a surface which is shiny and to measure the temperature of the tape in the hope it is not much different than that of the object in order to reduce errors from reflected infra-red radiation. 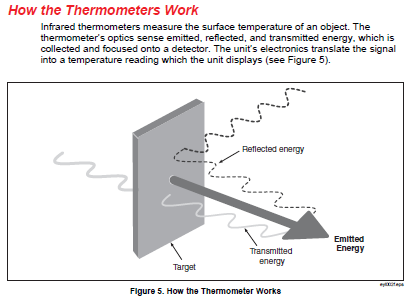 This figure is from the Fluke 56x User's Manual. Most pyrometers measure temperatures by measuring the infra-red radiation in the 8 - 14 micron wavelength range. Those designed to measure temperatures near ambient or cooler than ambient temperatures will have a sensor which is cooled by a thermoelectric cooling device based on the Peltier effect. Such devices can cool to temperatures about 70K below the ambient temperature, which is why most pyrometers have a lower temperature measurement level of -30 to -40 C. Use of a cooled sensor lowers the noise level and it establishes a known temperature energy sink for energy radiated from the object whose temperature is to be measured. The sensor temperature can be directly measured by a built-in thermocouple and then used as a known temperature reference for the remote object. Because of that cooled sensor, the measuring device is not a passive device. It alters the electromagnetic field in its vicinity by introducing the lower temperature region of its sensor. The consequence of this is that in order to measure the emitting object temperature more accurately, it actually changes the flux of infra-red radiation in its vicinity. A pyrometer does not measure the infra-red radiation that was in that vicinity before the pyrometer perturbed the radiation field. It is designed to measure temperatures, not to measure radiation power densities. The important property that defines a black body cavity is the fact that its interior has a constant energy density. The chemical potential of black body radiation is zero, which means that more photons are automatically generated by the cavity walls if the volume of the cavity is increased to maintain the constant energy density inside the cavity. U/V = u = aT4, where U is the total interior cavity energy, V is the cavity volume, and a is Stefan’s constant. Very close to the exterior surface in vacuum with the black body emitter surrounded by space at 0 K, u = aTs4, where Ts is the surface temperature, just as is the case in the interior of a black body cavity. The energy of the photons per unit volume is equal to the energy density u. The energy density of radiation decreases with the square of the distance from this radiator. The black body radiator radiates energy because its temperature is a measure of the kinetic energy in its material and that kinetic energy is causing electric dipoles to generate an electric field. That electric field strength diminishes with distance. The field generates photons that travel along the field lines into the distant lower field strength regions, which are at a lower temperature. Let us place another black body radiator a relatively short distance h away from the first black body radiator at a temperature Ta. It perturbs the electric field created by the first black body radiator’s oscillating electric dipoles. Its own oscillating dipoles would in isolation being emitting radiation isotropically into space, but because of the other black body radiator a short distance h away from it, electric field lines will be developed between the two bodies. If the temperature Ta is less than that of Ts, the field will lose amplitude as it approaches this second body. The field will cause photons to travel from the stronger field at the higher temperature body toward the lower field strength at the lower temperature body. This is just as happens when a single body is present and all the photons follow the diminishing strength field lines into the far distance of space. The photons flow from the strong field developed by the oscillating electric dipoles to the weak field sinks. When the body with Ta less than Ts is inserted, all photons still travel from the higher temperature body with the stronger electric field to the lower temperature body with the weaker electric field near it. If the usual picture of two black bodies radiating photons at the rate characteristic of such bodies when isolated in space and far from anything not at or very near 0 K were true, then when we examine the space on the direct line between these bodies the value of u = a ( Ts4 + Ta4 ), that is the photon density is the sum of the radiated densities for each isolated body. But we know that this is not the case. The energy density is actually u = a ( Ts4 - Ta4 ). If the usual assumption of photon flow in both directions were true and each photon stream does not interact with the stream of photons from the other black body emitter, then arbitrarily close to the surface of either black body radiator, the energy density would be greater than it would be inside a black body radiator cavity. If Ts and Ta were equal, we would have the particularly nonsensical result that the energy density arbitrarily close to the outside surface of either body would be twice that found inside the cavity of such an ideal black body! Therefore, photons only complete the travel from the warmer body to the cooler body with the power density given by the usual relationship that P = σ (Ts4 – Ta4). Consider the surface of the Earth for a moment. The density of atoms per cubic meter in the surface is about 1 gram per cubic centimeter for the water that covers about 71% of the Earth's surface and even greater for land materials or if considering the salts in the oceans. Expressed as a density per cubic meter of water, this is 1000 kg per cubic meter. A cubic meter of water has 3.34 x 1028 molecules. Infra-red emission and absorption in a surface occurs mostly in the outer 2 micrometers of the surface. Consequently, there are about 6.7 x 1022 water molecules emitting infra-red at most from the surface. These are the same surface molecules that absorb any incident infra-red radiation on the water surface. The density of the atmosphere near the surface at sea level is 1.225 kg per cubic meter in the U.S. Standard Atmosphere at 288.15K. The number of molecules per cubic meter at sea level in the U.S. Standard Atmosphere is 2.55 x 1025/m3. The important infra-red active gas near the surface is water vapor and its density per cubic meter is commonly between 10 g/kg to 14 g/kg of air as shown in Fig. 7. below. At a specific humidity of 12 g/kg, the number of water molecules/m3 of air is about 4.9 x 1023. Therefore, there are more water molecules in the first cubic meter of air above 1 m2 of water surface emitter or absorber molecules by a factor of 7.3. This should mean that radiation that can be absorbed by water vapor will be absorbed in the first meter of air above the surface at a humidity near the Earth average humidity. Fig. 7. 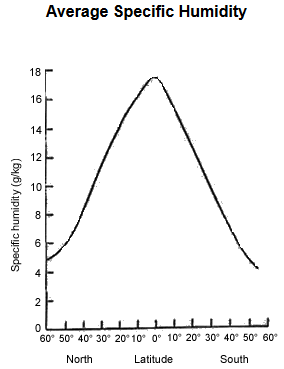 The average specific humidity of air is shown as a function of latitude. The specific humidity is the weight of water in grams in one kilogram of air. In comparison, at the current 400 ppm of carbon dioxide, there are 1.0 x 1022 molecules of CO2 /m3. There are 49 water vapor molecules for every carbon dioxide molecule at a specific humidity of 12 g.kg. In addition, the emissivity of CO2 molecules is less than 40% that of water vapor molecules. Many of the carbon dioxide molecule absorption peaks are largely or mostly already absorbed by overlapping water vapor absorption lines, so the effect of CO2 near the surface is very minimal compared to that of water vapor. This is less true at altitudes above 4 km when water vapor is very low, but carbon dioxide maintains a proportional mixing with nitrogen and oxygen. However, such altitudes have nothing to do with the back-radiation issue. for the surface s and the atmosphere water vapor a and if we take the emissivities to be 0.95, this is equal to 0.033 W/m2. Thus, the absorbed back-radiation has an upper limit of about 0.0006% of the average solar insolation at the top of the atmosphere (342 W/m2 ) ! For all intents and purposes, the absorbed back-radiation is zero. So, I conclude that the radiation from atmospheric molecular emitters that can be radiated back to the surface is very nearly zero thanks to the short absorption lengths of infra-red that can be absorbed by water vapor and the high molecular collision rates near the surface in the atmosphere. We exaggerate the energy of down-welling radiation by using active sensors to measure temperatures. The sensor purposely inserts a cooler region to establish a low-field sink with known temperature to make an accurate measurement of the temperature of bodies it needs to determine. Many then wrongly infer the measured photon flux was there prior to the measuring instrument being introduced into the many-body electric field. They assume the photons emitted from an object of the measured ​temperature were previously present. The instrument is active, not passive as assumed. The two energy budgets of Figs. 1 and 3 with large back-radiation absorption by the surface posit the deposition of large amounts of power in the atmosphere. The atmosphere simply does not have enough energy flow into it to send 100% of the solar insolation back to the Earth as infra-red radiation and also send 59% of solar insolation equivalent energy into space, which is the claim of Fig. 1. There is a problem here with energy conservation despite the power fluxes being in near balance in that NASA 2013 Earth Energy Budget. The atmosphere simply cannot be flinging 159% of the energy from the sun, especially when 29% of the solar insolation is never absorbed by anything because it is simply reflected and since the surface is flinging a power flux of 12% into space with no interaction with the atmosphere at all. So, this energy budget would have us believe that 100% - 29% - 12% = 59% of the solar insolation so heats the atmosphere that it can fling out 159% of solar insolation energy equivalent. This is unphysical and in violation of the Conservation of Energy. It is also clear that the Fig. 1. 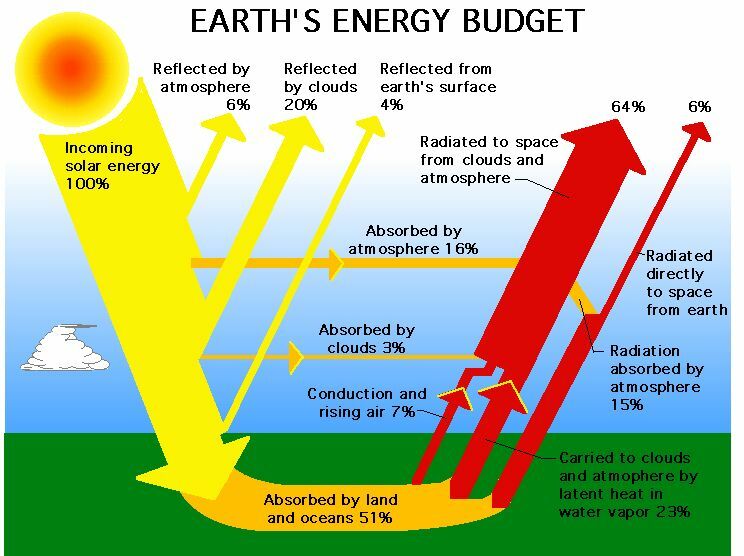 NASA Energy Budget violates Conservation of Energy at the surface. The entire energy flow rate into the Earth system is 71% of solar insolation, yet it claims to have energy flowing out of the surface at a rate of 117% of the solar insolation and flowing into the surface at a rate of 100% for a total energy flow rate of 217% compared to a maximal upper limit of 71%. Now why has NASA claimed that the energy flow rate out of the surface is 117%? It is perhaps because it is measuring the 20% of the energy flow rate from the surface due to emitted infra-red and adding a large amount of infra-red radiation emitted by the atmosphere in the lower troposphere. In that case, it is to be expected that the measured energy flux will appear to be much amplified. More likely it is just because the creators of this energy budget believe that every gray body emits radiations just as it would in vacuum with only 0 K bodies surrounding it. One can make that error and perform many types of calculations to get the right answer. In no case is it plausible that the long-wave infra-red energy flow rate can exceed 71% in this Fig. 1. Energy Budget unless there is another, non-solar radiation, source of energy. If the flow of energy through the atmosphere is taken into account, one can show that the flow of energy out of the surface is 48%. It is not enough to conserve the power density fluxes. Power density is an energy flow per unit time and per unit area. That energy must still be conserved as a critical constraint. One can make up many a mythical power density flow pattern with flux equilibrium across boundaries which violates Conservation of Energy. This is a frequent problem that brings headaches to many electromagnetic field calculations in physics. James Clerk Maxwell was adamant that one had to constantly check for Energy Conservation when doing electromagnetic field calculations. The Stefan - Boltzmann Equation applied to one body in space or to many-bodies is just such an electromagnetic field calculation. The so-called Energy Budgets are usually a picture of the various energy absorption and emission events that occur, excepting back-radiation, but they are not usually consistent with energy conservation or the conservation of energy flows. Consequently, the so-called Energy Budgets commonly make it appear that the energy of the original energy packet has somehow been multiplied. In reality, no such thing has happened. Energy is conserved. As a consequence, the Fig. 1 Earth Energy Budget with Surface Radiation of 117% and Back-Radiation of 100% absorbed by the surface is terribly wrong. The Fig. 3 Kiehl-Trenberth Earth Energy Budget featured in the UN IPCC 4th Assessment Report of 2007 with Surface Radiation of 114% and a down-welling absorption of 94.7% is also terribly wrong. Both of these and many other Earth Energy Budgets with Surface Radiation Absorbed by the atmosphere (SRA) comparable to or greater than the total absorbed solar insolation in the Earth system are clearly wrong. So are all those with large or indeed any surface-absorbed down-welling atmospheric radiations (ARAS). These errors indicate a vast misunderstanding of the role of infra-red absorbing gases in the Earth's climate. The great exaggeration of the role of so-called greenhouse gases as energy multipliers greatly exaggerates the ability of carbon dioxide to raise the surface temperatures of the Earth as its atmospheric concentration increases. This is a fatal error in the settled science of catastrophic man-made global warming theory. For instance, it is commonly stated that a doubling of the carbon dioxide concentration in the atmosphere would cause an additional heating of the surface equivalent to 3.71 W/m2, or about 1.1% of solar insolation at the top of the atmosphere. This claim is actually based on an assumption that all of the warming since the pre-industrial period just after the Little Ice Age was due to the increase in carbon dioxide in the atmosphere over that time. It is commonly said that this happened because the narrowing of the atmospheric window to long-wave infra-red radiation from the surface caused by higher concentrations of carbon dioxide results in less power density escaping the Earth system into space. The lowered escape of power density then is said to warm the Earth. The actual heating due to the narrowing of the atmospheric window is less than is estimated since much of the warming since the Little Ice Age has nothing to do with the increased concentration of carbon dioxide. When oceans warm, they emit dissolved carbon dioxide in large quantities. But as is well-known, the oceans warm first and then carbon dioxide concentrations increase over long periods of time, such as 800 years. At present, the combined effects of water vapor and carbon dioxide do not significantly increase the surface temperature due to adding to the absorption by the surface of infra-red long-wave radiation from the atmosphere. They add more significantly to the emissivity of the lower troposphere. The emitted photons then follow the weakening electric field and lower density of infra-red active molecules space-ward, which carries energy into the cooler upper atmosphere and finally into space. Therefore, the so-called greenhouse gases actually act as coolants in the lower atmosphere, which is where we are most affected by temperature changes. In addition, increased concentrations of infra-red active gases absorb more solar insolation so that it never reaches the surface to warm it in the first place. The net effect of increasing their concentrations is a cooling effect of the surface and the lower troposphere, which has long been known through the lowered temperature gradient in the lower troposphere caused by greater humidity. That effect is dependent upon the fact that the Earth's surface does not absorb down-welling long-wave radiation from the atmosphere in the equilibrium condition in which the atmosphere is cooler than the surface. The quick energy transport due to radiation emission from the infra-red active gases with comparison to slower convection and water vapor condensation processes, removes heat more rapidly toward higher altitudes, thereby cooling the surface. However, it should always be remembered that the primary transport mechanisms for heat in the lower troposphere are convection and the water evaporation and condensation cycle. This is the primary reason the Earth's surface is not in radiative equilibrium with space. From the standpoint of space, the surface emissivity, as was calculated above, is only about 0.105, while the atmospheric emissivity is about 0.923. The high collision frequency relative to the time it takes for an infra-red active molecule to re-emit long-wave infra-red radiation absorbed ensures that the active molecule almost always emits infra-red radiation only after it has collided many times with other non-radiating molecules. Because the mean free paths of such long-wave infra-red radiation as is emitted and absorbed by infra-red active molecules are short, the corresponding temperature differences between the emitting and absorbing molecules are very small. Therefore, the amount of energy transported by each such process is small. In addition, these infra-red molecules are relatively rare in the atmosphere, so the total long-wave energy transported by radiation relative to that transported by convection and the water evaporation and condensation processes in the lower troposphere is relatively small. This helps to ensure that radiative effects on the surface temperature, even those of the very dominant infra-red active gas water vapor, are secondary effects, not the primary effects pictured by a claim that greenhouse gases warm the Earth's surface by 33 K.
This post has been updated between 14 March 2014 and 27 June 2014.